Will rapidly rising oilfield service costs derail efforts by companies to maintain fiscal austerity while hitting their production targets? That question emerged as a major theme during fourth-quarter earnings calls, and analysts say the answer is an emphatic no. WTI oil prices that have risen from a 2015-2017 average of $48/b to roughly $60/b have buoyed the industry and settled a blanket of confidence over oil company boardrooms. Low prices had stemmed from a rapid rise in shale oil output, which added nearly 4 million b/d of crude from end-2010 to end-2014. The event caught upstream companies, long used to outspending their incomes, off-guard. Now that industry is well into recovery mode, most observers believe the painful recent past has made a deep impression that won’t easily be forgotten. Not only will operators almost universally try to spend within their cash flows, but higher oil prices have now resulted in excess, or free, cash flows for many oil companies. Others will achieve that status this year or in 2019. 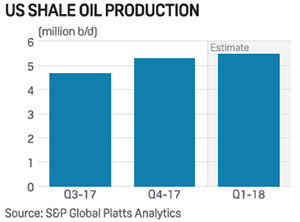 While excess cash flows will be spent on mending balance sheets or returning cash to shareholders, rig count additions will likely be “modest” this year, according to a Platts Analytics review of tight oil operators. Platts Analytics expects 100 more active rigs in the fleet this year than the 650 that stood at year-end 2017. By contrast, E&P operators added 273 rigs last year. Even with relatively few rig adds, many of the biggest independent producers expect their production to rise by double-digits this year. Platts found 13 of 16 large independent producers are expecting 2018 production increases of 12% to 40%, including ConocoPhillips, Concho Resources and EOG Resources. In Q4 2017, crude and condensate production from US shale jumped 14% to 5.3 million b/d from the prior quarter. That was driven by “accelerated” completions, particularly in the Permian Basin of West Texas/New Mexico, Platts Analytics indicated. While completions of previously drilled but unfinished wells — popularly known as DUCs — were slow for most of 2017, new well tie-ins picked up near year-end. That accounted for the rise in oil production by about 650,000 b/d in Q4, the Platts Analytics review said. As year-end 2017 neared and crude prices headed toward the psychologically important $60/b level, confidence was running so high that several oil and gas companies provided Wall Street with not just a single year of guidance, as is customary, but three years, from 2018 to 2020. For example, Noble Energy, Devon Energy and Concho Resources all stated they believed they could sustain growth levels for total production, oil production, or both, in the double-digits during that period. Their confidence came from drilling results in 2017 — where drilling longer horizontal well legs, using more proppant to keep well fractures open, and better “landing” of the drill bit in the choicest parts of subsurface zones has gradually lifted per-well oil volumes in recent years. Throughout the 2015-2016 downturn, oil companies became expert at driving more and more oil from the ground at increasingly lower costs — a knack which keeps improving. In fact, even though oilfield service and equipment costs are expected to rise 7% to 15% this year, which the Platts Analytics review believes will largely come from drilling and well completions, oil companies claim continued efficiencies and other mitigations can offset cost increases. For example, operators pre-purchased goods and services such as contracting rigs late last year or earlier this year for all of 2018 rather than on an as-needed basis, using locally sourced sand and other proppants for hydraulic well fracturing, and self-sourcing their goods and services. Even so, rising costs “remain a concern,” the Platts Analytics review said. The expected 7% to 15% cost increase estimated for this year is on top of about 10% to 15% cost inflation in late 2017, Floyd Wilson, CEO of small-cap Halcon Resources, said earlier this month in a conference call, echoing other sources. “We’ve seen this every time there’s been a major movement in crude prices for decades,” said Wilson, who is also former CEO of Petrohawk Energy, which is generally credited with discovering the big Eagle Ford shale play in South Texas. BHP Billiton bought Petrohawk in 2011. But capital budget increases appear modest despite higher oil prices, rising about 10% to 15%, according to most accounts. For instance, a Cowen & Company analysis of 58 E&P companies found their 2018 capital spending plans on average were up just 11% over last year. Further out, consultants Westwood Global Energy Group expects a 15% year-over-year expenditure rise between 2018-2022 for six major shale basins that include the Permian, Eagle Ford, the Williston Basin in North Dakota/Montana, the DJ Basin in Colorado, the Midcontinent plays in Oklahoma and the Haynesville Shale, a gas play in North Louisiana and East Texas. An important variable in spending “will be the relaxation of supply chain constraints, as service providers add further [fracturing] capacity…allowing completion activity to accelerate, resulting in a 54% increase in completion spend this year,” the consultancy said.